Celebrating your birthday soon? Check out Ippudo Birthday Promo! Birthday celebrators enjoy a FREE BOWL OF RAMEN on your birthday, just bring 3 friends and celebrate as many times you want on your birthday month. Available in all Ippudo branches! Birthday celebrator of all ages can avail the birthday within their birthday month. Birthday celebrator gets one (1) free basic ramen (Shiromaru, Akamaru and Karakamen only) WITHIN THEIR BIRTHDAY MONTH, as long as accompanied by a minimum of 3 guests who will order any basic/special/LE ramen and/or any under the teppan rice category (Beef Ishiyaki and Unagi rice). Sidekicks are not included. 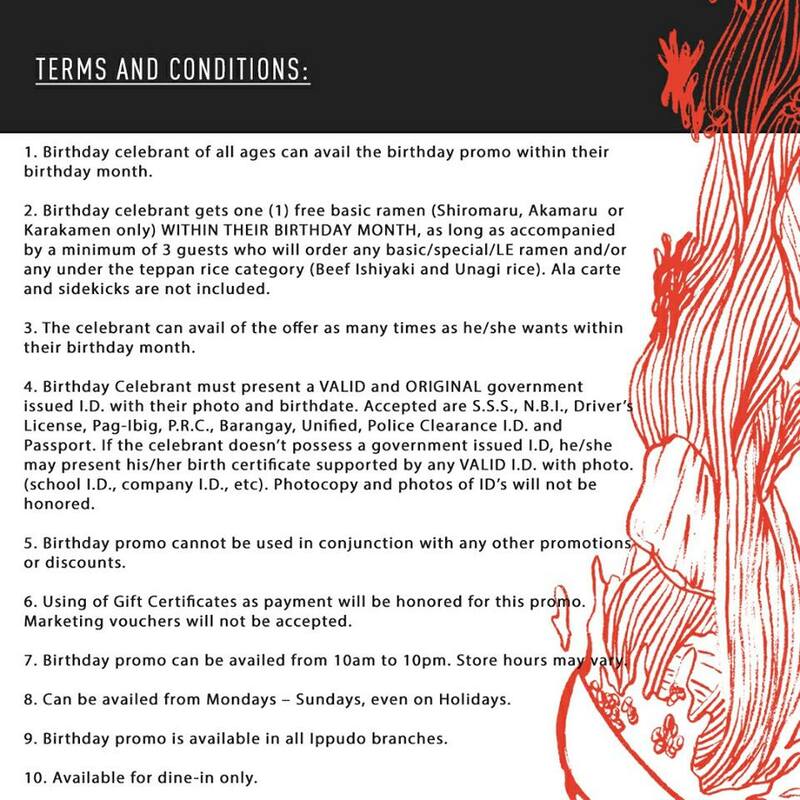 The celebrators can avail of the offer as many times as he/she wants within their birthday month. Birthday Celebrator must present a VALID and ORIGINAL government issued I.D. 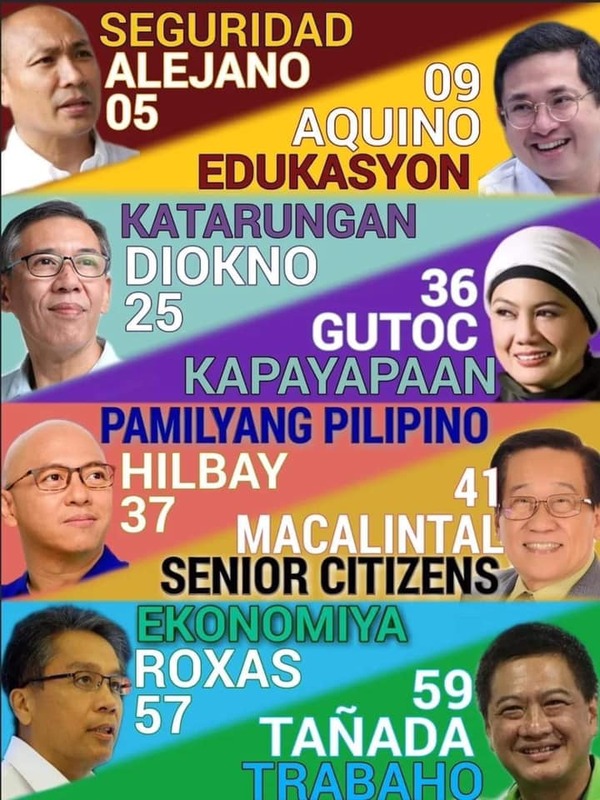 with their photo and birthdate. 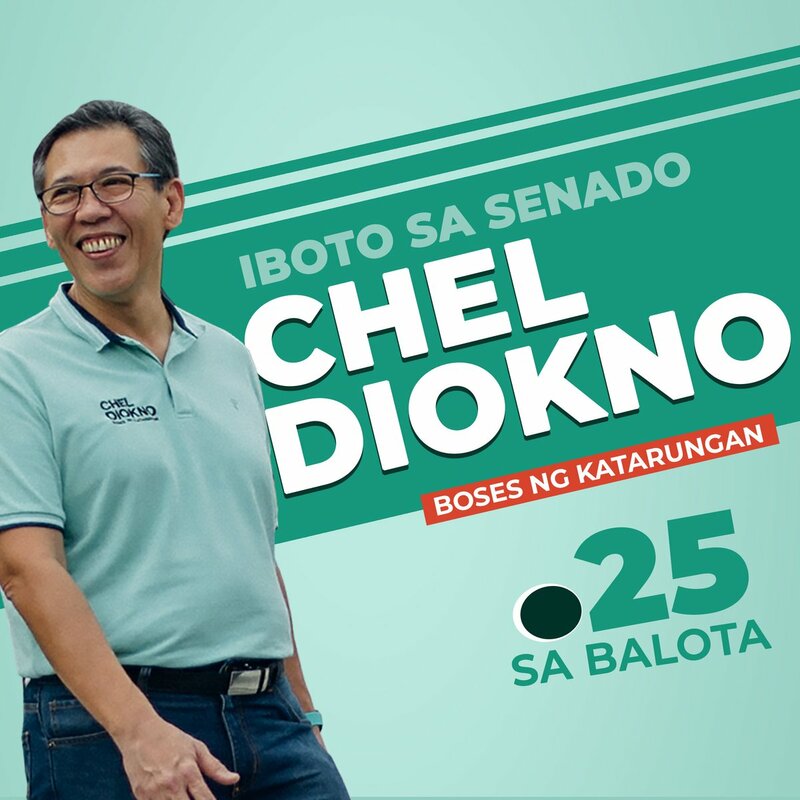 Accepted are S.S.S., N.B.I., Driver’s License, Pag-Ibig, P.R.C., Barangay, Unified, Police Clearance I.D. and Passport. If the celebrant doesn’t possess a government issued I.D, he/she may present his/her birth certificate supported by any VALID I.D. with photo. (school I.D., company I.D., etc). Photocopy and photos of ID’s will not be honored. 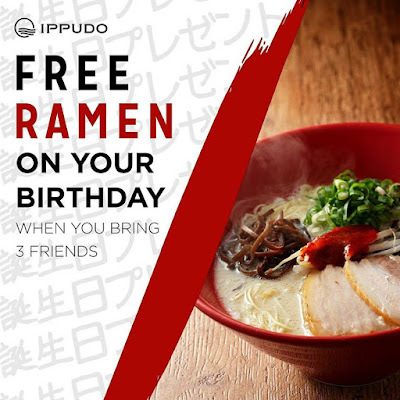 Ippudo Birthday promo can’t be used in conjunction with any other promotions or discounts. This Birthday promo can be availed from 10am to 10pm. Store hours may vary. Can be availed from Mondays – Sundays, even on Holidays. Birthday promo is available in all Ippudo branches for dine-on only.